FGV Schmidle is a respected rental house in Munich and Berlin, with more than 35 years' experience. 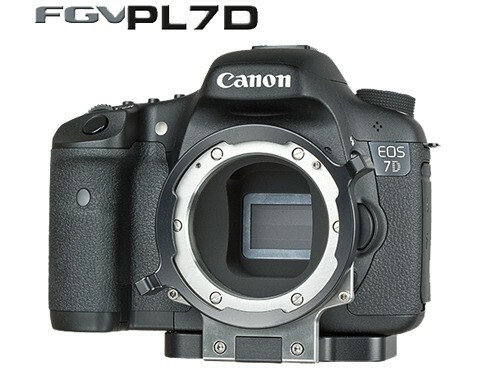 Their PL retrofits for Canon EOS 7D HDSLR cameras appear to be the most sophisticated yet. The excellent idea is how they've attached the PL mount to the base, which adds rigidity and provides three 3/8 x 16 standard threaded tripod mounts to prevent the camera from twistingwhich it normally does with its standard, puny, single 1/4 x 20 socket. In order to be able to use all PL mounted lenses, we had to redesign the original plastic case for the mirror and the sensor mount. There was no other possibility to update the original Canon housing and still provide the necessary rock-solid connection between the sensor and the PL-mount. We redesigned these parts to our needs by milling them out of a single metal block. The new carrier comes without the reflex-mirror. As a consequence, the autofocus unit, the groundglass and the prism viewfinder were also left out. In order to focus or to control the image the Live-View mode is used which also offers a decent magnification for critical settings. What we added is a rigid connection to the base plate to be able to mount the entire setup to any kind of professional support system. The FGV-PL7D is designed to be truly rock-solid even with big and heavy zoom lenses known from film sets: the new FGV sensor carrier module weighs more than 300g alone. The PL-Mount directly connects to a metal plate and a raiser plate that offers two 3/8" threads at the bottom for mounting. Together with the new sensor carrier and a solid mounting for the original 7D CMOS sensor a rugged and at the same time very precise imaging unit was designed. For external Start/Stop with a LCS or a simple remote switch there is a 3-pin Fischer connector. The rest of the camera stays the same. The 7D shoots frame rates of 23.98 / 25 / 29.97 fps @19201080 as well as 50 / 59.98 fps@1280720 or 640480. The sensor format is good for 1:1.78. The actual sensor size is 22.3 x 12.53mm, which is comparable to motion picture Super 35 3 Perforation ANSI 1.78 format (23.11 x 12.98mm). So, the 7D active senor size is very close to the standard 3 Perf film format. Which PL Lenses can be used with the FGV-PL7D? You can use all known 35mm PL-mount motion picture fixed focal or zoom lenses (Zeiss, ARRI, Cooke, Angnieux, Red...), which will fit on ARRI, Moviecam or Aaton, Red, Sony 35mm cameras. However, if you are planning a real crash scene, we will certainly help you out with a proper crash housing, a splash housing to film in or on water, or even an unmodified 7D that uses original Canon lenses. What about the flange-focal distance? Well, we are talking seriously about a real PL-mount - as a consequence we are using the same principles than in "real" movie cameras. So - yes: you can adjust the flange focal distance the regular, professional way if necessary. A day at the races: Canon 7D with Cooke PL primes from Philip Bloom on Vimeo.